Friday Finish - ALYOF Goal Achieved! Yeah for achieving another ALYOF goal!! 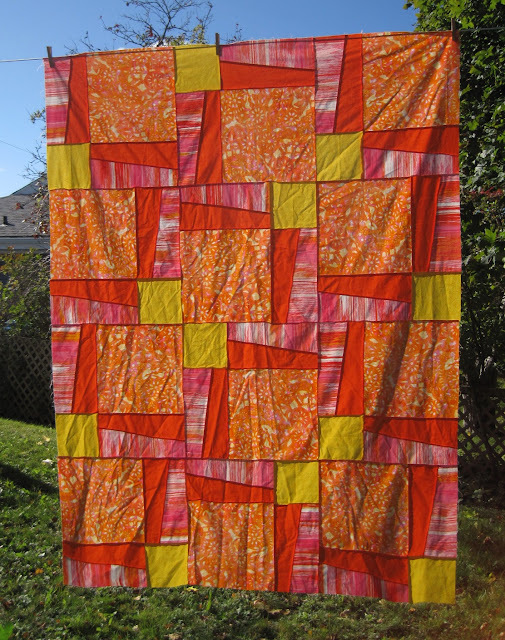 My October goal was to finish my Gees Bend quilt. I showcased my progress here. The "accountability" of participating in ALYOF has given me the motivation to finish projects. Here is my version of Debby Kratovil's pattern. First time attempting wavy/organic lines on my longarm. Some are better than others, but I am happy. I quilted with red thread and used a purple tone-on-tone for the backing. This will be a quilt that I will keep for myself. Earlier this year, I purchased the BQ3 pattern by Maple Island Quilts from my LQS. I finally got around to piecing the top. Unfortunately, I didn't realize that the orange solid and the orange print were of the same value, so the pattern is not as striking as it should be. Wow...there are a lot of wrinkles. A view from the back. 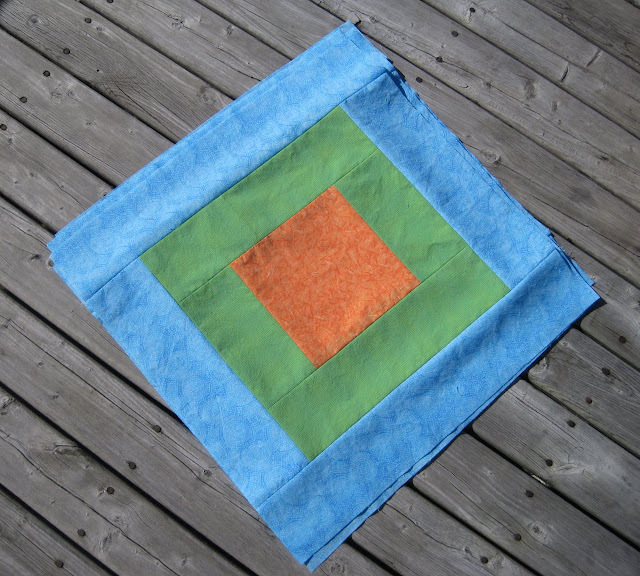 This one might end up being a charity quilt. 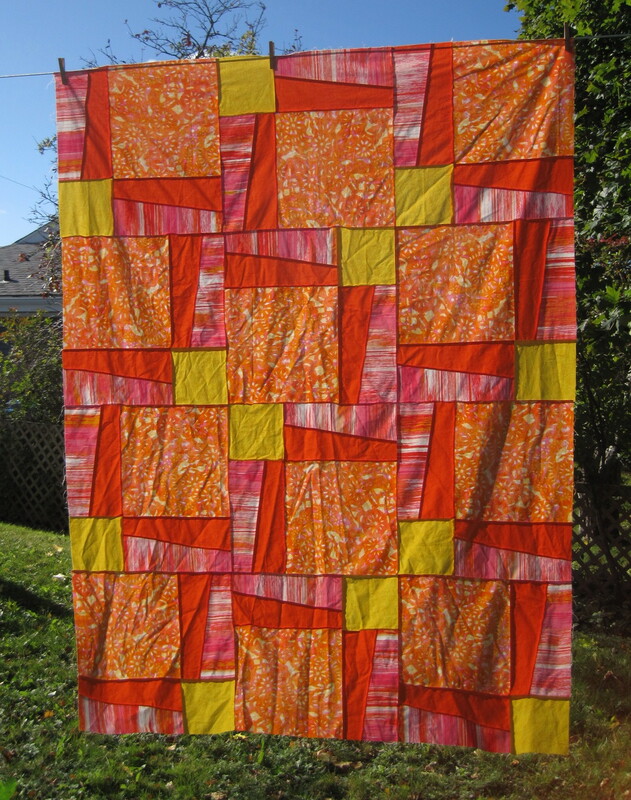 I'm going to FMQ, using a swirl pattern. This top pieced together very quickly. The pattern has two block sizes -- 9-inch and 18-inch. And there are six sizes included in the pattern. I made the 18-inch block, and the top finishes at 54 x 72 inches. October started out great: I was on top of projects (more or less), and I was sewing every day. And then...my sewjo disappeared, and there was not much sewing going on. Not sure if it was the change in weather, or perhaps that it's dark by 6:00 p.m. I am not looking forward to the time change in a few weeks. 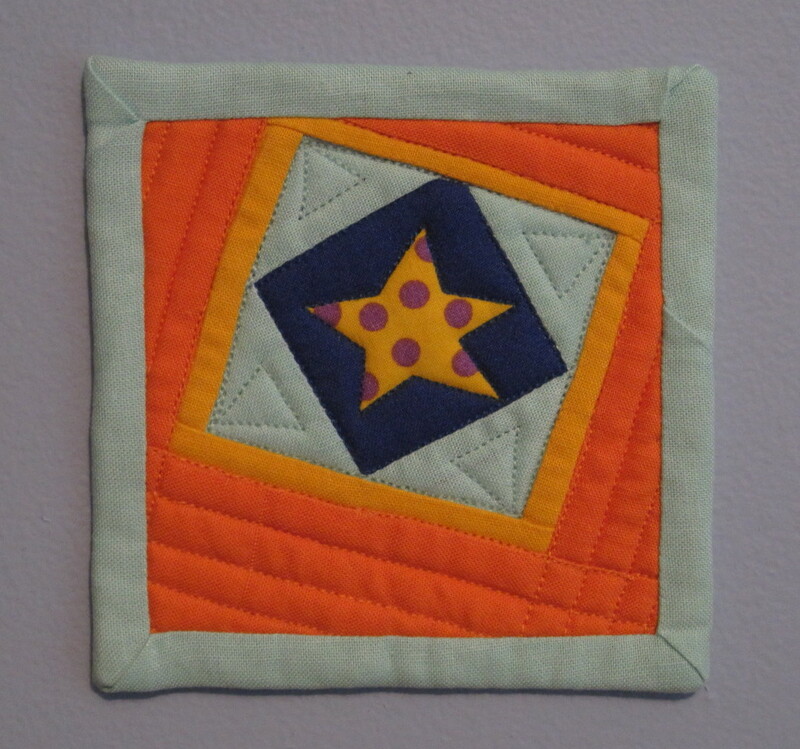 Here's a baby quilt using Elizabeth Hartman's Solar Eclipse. 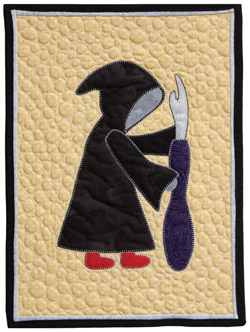 I took a vacation day yesterday to sew, but I was not as productive as I had hoped. But I think I got my sewjo back and then ended up sewing until midnight last night to finish this quilt. This is a great pattern (with three different sizes), but there's too much fiddly sewing of angled seams for my liking. 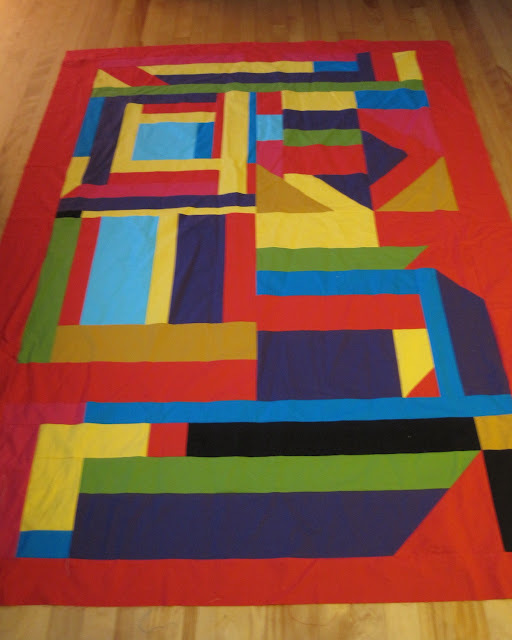 The quilt finishes at 32 x 32 inches, but it took six hours to piece -- and that's not including the time spent cutting the fabric and marking the angled seams. 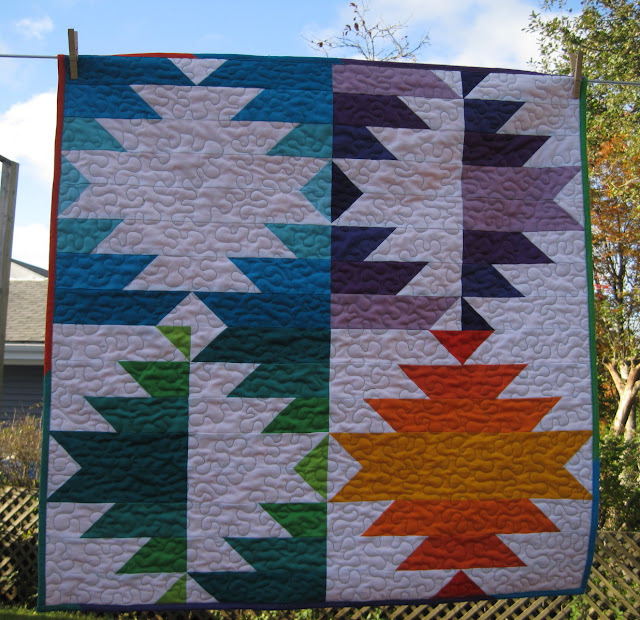 I thought about quilting in the white to make the colours pop, but then there would have been too much space unquilted. And because I just wanted it finished, I didn't put any more thought into it and just stippled all over. I need to get this finished this weekend before Halloween arrives. You may recall that I participated in the 2015 Fabri-Quilt New Block Blog Hop this past summer and designed a quilt block -- Floored. 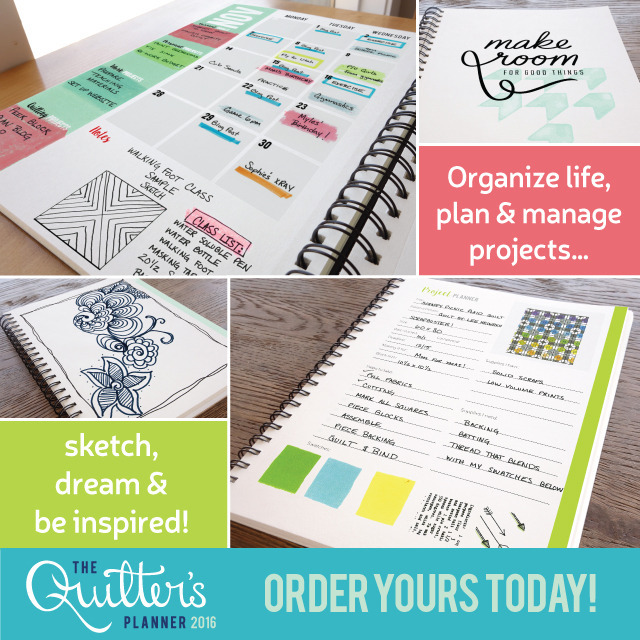 Stephanie @ Late Night Quilter has designed The Quilter's Planner for 2016, and Floored will be one of the featured weekly blocks. Stephanie is taking pre-orders, with delivery scheduled for December. Consider supporting a small business -- and get a great tool and resource in return. 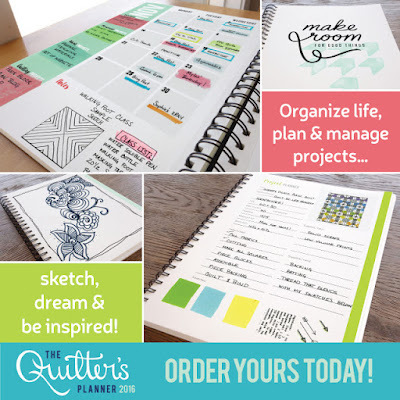 Have you seen the latest craze of making mini mini quilts? I've been enjoying all the wonderful creations being made. 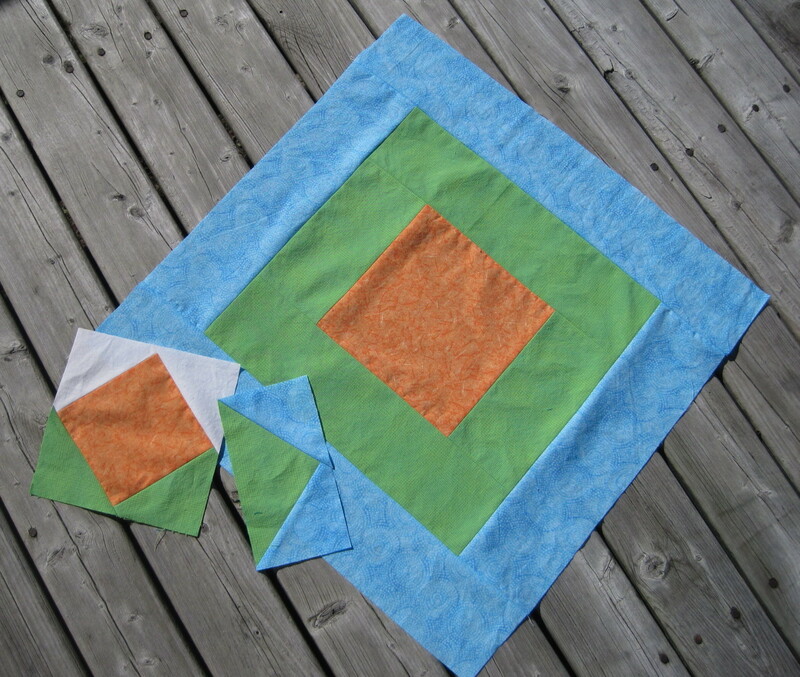 Yvonne over at Quilting Jetgirl has been making quite a few lately. I then discovered that Jayne over at Twiggy and Opal is also participating in the swap. I have been reluctant to participate as mini mini is a tad too small for me, but when Jayne asked if I would swap with her, I decided to give it a try and get outside of my comfort zone. Here's my 4.5-inch mini mini that I created for Jayne. 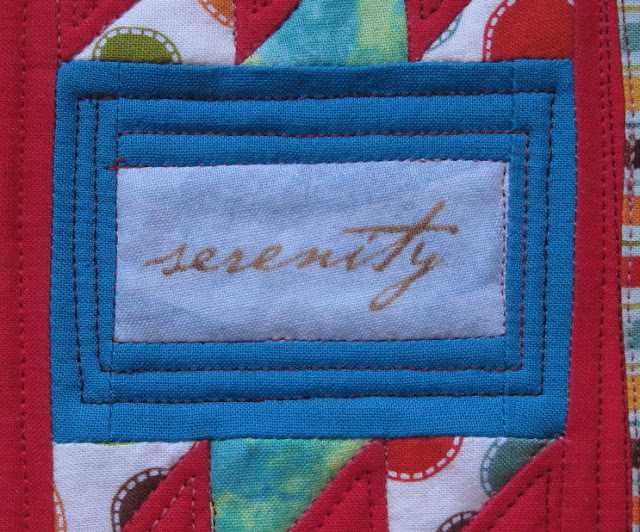 I cut out the word "serenity" from a word fabric and made it the focal point. 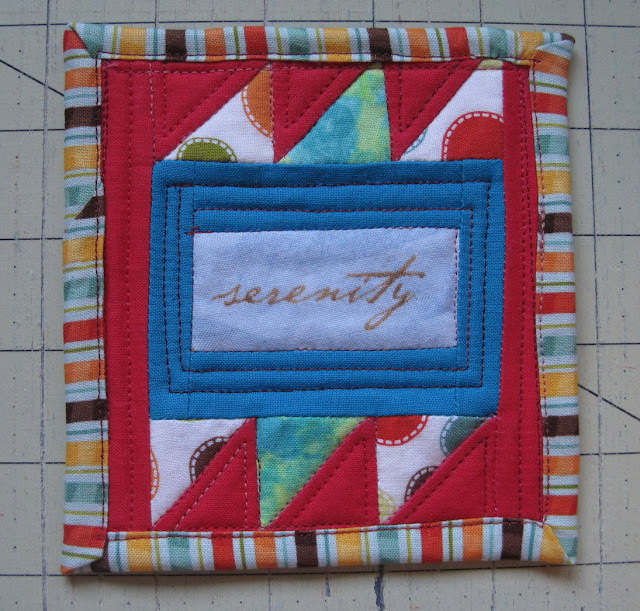 Since I was already stretching my limits, no fancy quilting. In hindsight, I should have hand-stitched the binding. This is wonderful mini that Jayne sent to me. I then agreed to swap with Leanne @ Devoted Quilter. I attempted improv, but it didn't turn out as I had pictured it in my head. So I made another one, and this is the one that Leanne has chosen. Anyone looking for a swap partner? 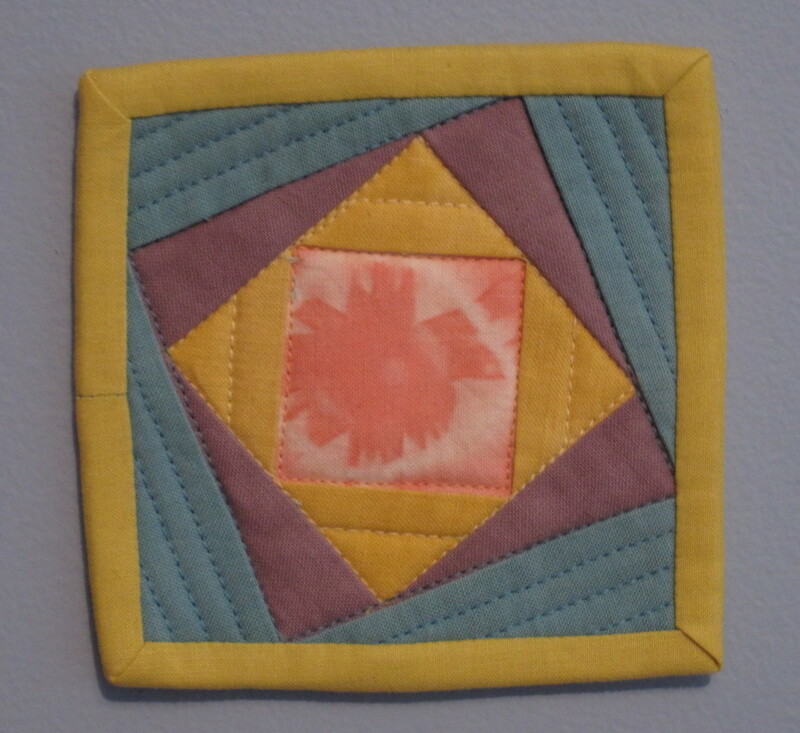 I don't think mini mini quilts are my new addiction, but I am open to trying a few more. I'm making great progress on my October goal for A Lovely Year of Finishes. The quilt top pieced together quite quickly. I finally got my clothesline replaced on Monday and was hoping for a great photo shoot on Tuesday. But alas Mother Nature did not cooperate -- it rained all day long. So I had to take indoor photos. Closeup of two of the sections. 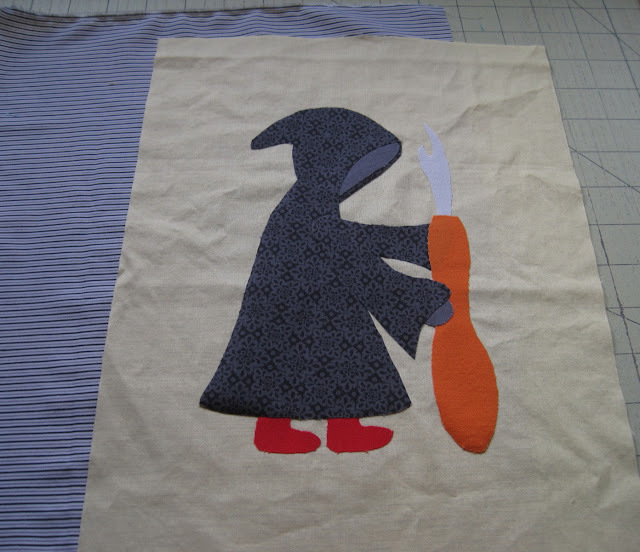 Now to decide on quilting. 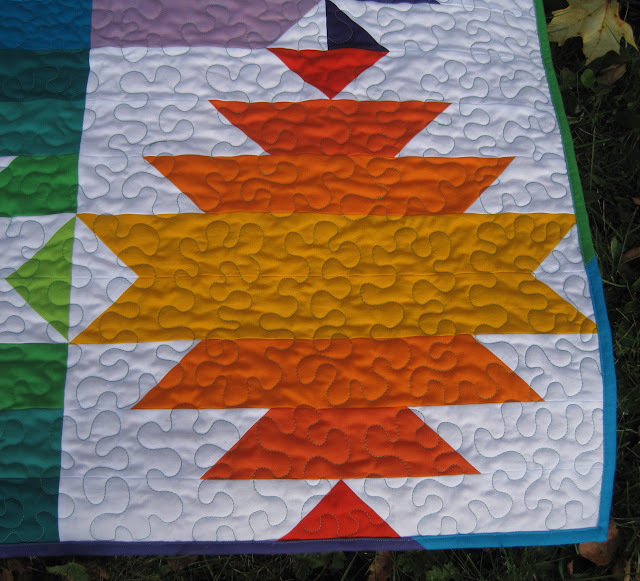 I'm thinking something simple so not to distract from the pattern -- perhaps straight lines up and down (or somewhat straight as I think I'll quilt it on the longarm). 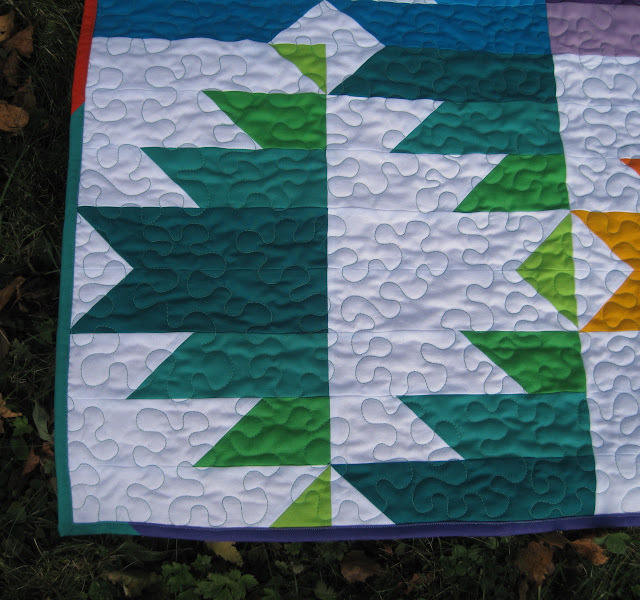 I would love to hear your quilting suggestions. Thanks. 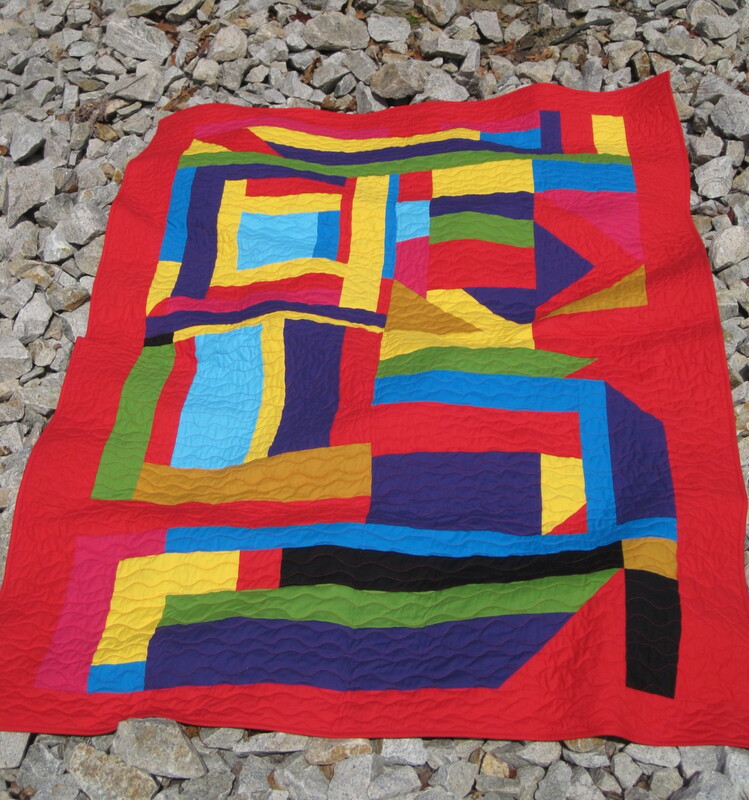 The October instructions for the Midnight Mystery Quilt hosted by Cheryl over at Meadow Mist Designs were released last week -- make 9 Court House Step blocks. The blocks finish at 19-inches and uses three of the four fabrics. I love making big blocks -- no small pieces to sew. The August blocks were flying geese, and September's were square in a square. I'm having trouble visualizing how these blocks are going to play together. I'm sorry that I finished October so quickly as I now have four weeks to wait until November's instructions are revealed. The suspense!! 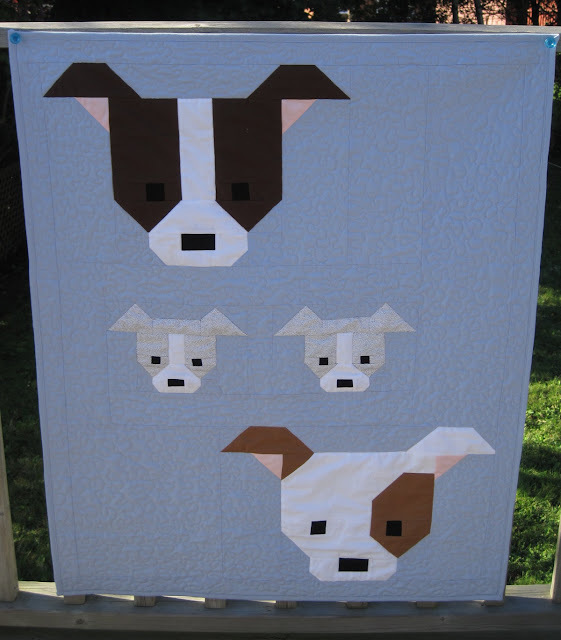 Lorna over at Sew Fresh Quilts comes up with the most adorable animal patterns. Her latest is Dog Gone Cute. Today is Day 1 of the blog hop showcasing some of the wonderful dog creations that have been in the works since September. 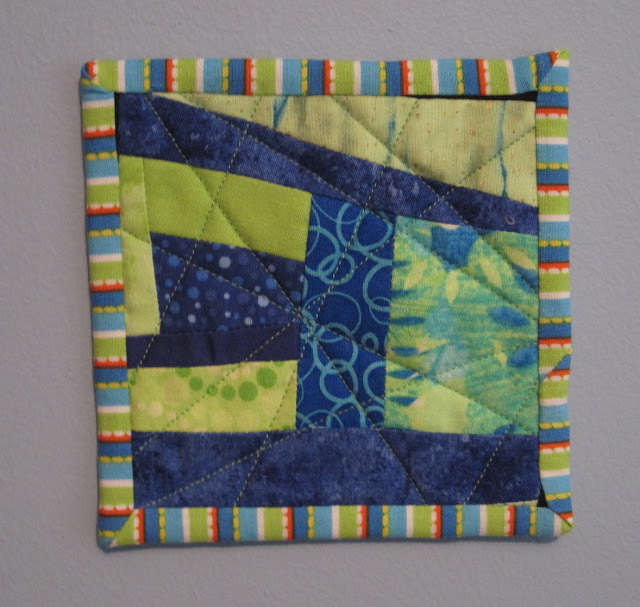 I decided to make a baby quilt using Kona Bluebell for the background. I didn't want to FMQ through all their cute little faces, so I used the walking foot to outline the faces. That was a lot of twisting and turning. Next time, I'm just going to quilt their faces and save myself the headache. This is Dog #1 in the large block. Dog #3 in the large block. Dog #5 in the small block. 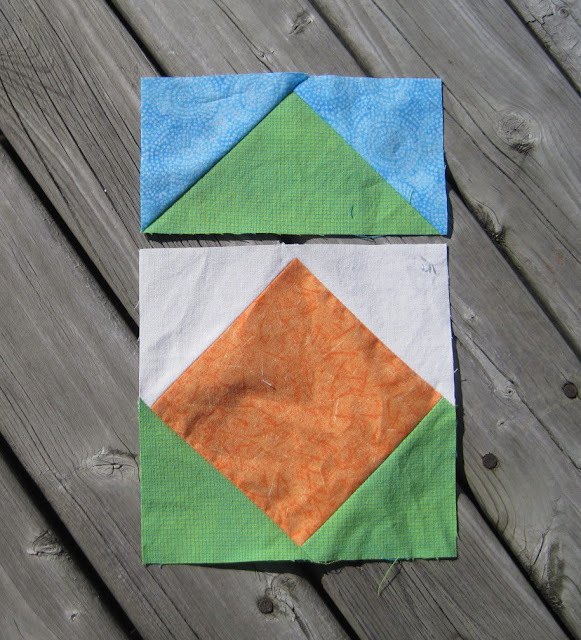 Lorna graciously posted a tutorial for the various dog blocks on her blog. There's still time to participate. 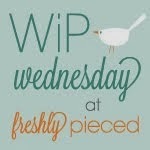 Here is the blog hop schedule for this week. 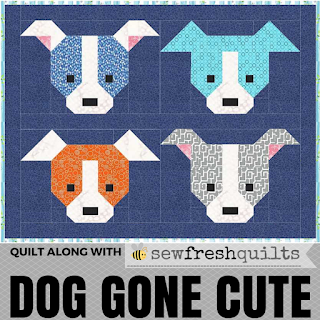 Stop by to see all the Dog Gone Cute creations.